"Pieces of eight" redirects here. For the album, see Pieces of Eight. "King and Queen of Castile, Leon, Aragon..."
"Both (are) one, Mexico [City Mint], 1739"
"Philip V, by the Grace of God, King of the Spains and the Indies"
Displays the arms of Castile and León with Granada in base and an inescutcheon of Anjou. "Ferdinand VI, by the Grace of God, King of the Spains and the Indies"
"Charles III by the Grace of God, 1776"
HISPAN[IARUM] ET IND[IARUM] REX M[EXICO] 8 R[EALES] F M "King of the Spains and the Indies, Mexico [City Mint], 8 reales"
Crowned Spanish arms between the Pillars of Hercules adorned with PLVS VLTRA motto. HISPAN[IARUM] ET IND[IARUM] REX M[EXICO] 8 R[EALES] T H"King of the Spains and the Indies, Mexico [City Mint], 8 Reales." Crowned Spanish arms between the Pillars of Hercules adorned with PLVS VLTRA motto. HISPAN[IARUM] ET IND[IARUM] REX M[EXICO] 8 R[EALES] I I"King of the Spains and the Indies, Mexico [City Mint], 8 reales." Crowned Spanish arms between the Pillars of Hercules adorned with PLVS VLTRA motto. The Spanish dollar was widely used by many countries as the first international/world currency because of its uniformity in standard and milling characteristics. Some countries countersigned the Spanish dollar so it could be used as their local currency. The Spanish dollar was the coin upon which the original United States dollar was based, and it remained legal tender in the United States until the Coinage Act of 1857. Because it was widely used in Europe, the Americas, and the Far East, it became the first world currency by the late 18th century. Aside from the U.S. dollar, several other currencies, such as the Canadian dollar, the Japanese yen, the Chinese yuan, the Philippine peso, and several currencies in the rest of the Americas, were initially based on the Spanish dollar and other 8-real coins. Diverse theories link the origin of the "$" symbol to the columns and stripes that appear on one side of the Spanish dollar. The term peso was used in Spanish to refer to this denomination, and it became the basis for many of the currencies in the former Spanish colonies, including the Argentine, Bolivian, Chilean, Colombian, Costa Rican, Cuban, Dominican, Ecuadorian, Guatemalan, Honduran, Mexican, Nicaraguan, Paraguayan, Philippine, Puerto Rican, Peruvian, Salvadoran, Uruguayan, and Venezuelan pesos. Of these, "peso" remains the name of the official currency in Argentina, Chile, Colombia, Cuba, Dominican Republic, Mexico, Philippines, and Uruguay. Millions of Spanish dollars were minted over the course of several centuries. They were among the most widely circulating coins of the colonial period in the Americas, and were still in use in North America and in South-East Asia in the 19th century. In the 16th century, Count Hieronymus Schlick of Bohemia began minting a coin known as a Joachimsthaler (from German thal, modern spelling Tal, "valley", cognate with "dale" in English), named for Joachimsthal, the valley in the Ore Mountains where the silver was mined (St. Joachim's Valley, then part of the Kingdom of Bohemia within the Holy Roman Empire, now Jáchymov, part of the Czech Republic). Joachimstaler was later shortened to taler, a word that eventually found its way into Norwegian, Danish and Swedish as daler, Russian as талер (táler), Czech and Slovene as tolar, Polish as talar, Dutch as daalder, Amharic as ታላሪ (talari), Hungarian as tallér, Italian as tallero, Greek as τάληρο (taliro), Spanish tálero and English as dollar. The Joachimsthaler weighed 451 Troy grains (29.2 g) of silver. So successful were these coins that similar thalers were minted in Burgundy and France. The Burgundian Cross Thaler depicted the Cross of Burgundy and was prevalent in the Burgundian Netherlands that were revolting against the Spanish king and Duke of Burgundy Philip II. After 1575, the Dutch revolting provinces replaced the currency with a daalder depicting a lion, hence its Dutch name leeuwendaalder. Specifically to facilitate export trade, the leeuwendaalder was authorized to contain 427.16 grains of .750 fine silver, lighter than the large denomination coins then in circulation. Clearly it was more advantageous for a Dutch merchant to pay a foreign debt in leeuwendaalders rather than in other heavier, more costly coins. Thus, the leeuwendaalder or lion dollar became the coin of choice for foreign trade. It became popular in the Middle East, and colonies in the east and west. They also circulated throughout the English colonies during the 17th and early 18th centuries. From New Netherland (New York) the lion dollar spread to all thirteen colonies in the west. 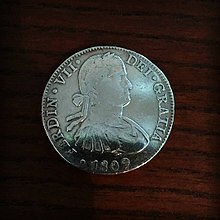 English speakers began to apply the word "dollar" also to the Spanish peso or "piece of eight" by 1581, which was also widely used in the British North American colonies at the time of the American Revolution, hence adopted as the name and weight of the US monetary unit in the late 18th century. After the introduction of the Guldengroschen in Austria in 1486, the concept of a large silver coin with high purity (sometimes known as "specie" coinage) eventually spread throughout the rest of Europe. Monetary reform in Spain brought about the introduction of an 8-real coin in 1497. In 1537 the Spanish escudo gold coin was introduced, which was worth 16 reales. The later Gold Doubloon was worth 32 reales or 2 escudos. It is this divisibility into 8 which caused the silver coins to be named "pieces of eight". In the following centuries, the coin was minted with several different designs at various mints in Spain and the New World, having gained wide acceptance beyond Spain's borders. Thanks to the vast silver deposits that were found mainly in Potosí in modern-day Bolivia and to a lesser extent in Mexico (for example, at Taxco & Zacatecas), and to silver from Spain's possessions throughout the Americas, mints in Mexico and Peru also began to strike the coin. The main New World mints for Spanish dollars were at Potosí, Lima, and Mexico City (with minor mints at Bogotá, Popayán, Guatemala City, and Santiago), and silver dollars from these mints could be distinguished from those minted in Spain by the Pillars of Hercules design on the reverse. In the 19th century, the coin's denomination was changed to 20 reales (based on 20 reales de vellón) and finally 2 escudos. Spain's adoption of the peseta in 1869 and its joining the Latin Monetary Union meant the effective end of the last vestiges of the Spanish dollar in Spain itself. However, the 5-peseta coin (or duro) was slightly smaller and lighter but was also of high purity (90%) silver. In the 1990s, commemorative 2000-peseta coins were minted, similar in size and weight to the 8 reales and also with high fineness. Following independence in 1821, Mexican coinage of silver reales and gold escudos followed that of Spanish lines until decimalization and the introduction of the peso. The Mexican 8-reales coin (eventually becoming a 1-peso coin) continued to be a popular international trading coin throughout the 19th century. After 1918, the peso was reduced in size and fineness, with further reductions in the 1940s and 1950s. However, 2- (1921), 5- (1947) and 10- (1955) peso coins were minted during the same period with sizes and fineness similar to the old peso. The term cob was used in Ireland and the British colonies to mean a piece of eight or a Spanish-American dollar, because Spanish-American gold and silver coins were irregularly shaped and crudely struck during this period. After the colony of New South Wales was founded in Australia in 1788, it ran into the problem of a lack of coinage, particularly since trading vessels took coins out of the colony in exchange for their cargo. In 1813, Governor Lachlan Macquarie made creative use of £10,000 in Spanish dollars sent by the British government. To make it difficult to take the coins out of the colony, and to double their number, the centres of the coins were punched out. The punched centre, known as the "dump", was valued at 15 pence, and the outer rim, known as the "holey dollar", was worth five shillings. This was indicated by over-stamping the two new coins. The obverse of the holey dollar was stamped the words "New South Wales" and the date, 1813, and the reverse with the words "five shillings". The obverse of the dump was stamped with a crown, the words "New South Wales" and the date, 1813, and the reverse with the words "fifteen pence". The mutilated coins became the first official currency produced specifically for circulation in Australia. The expedient was relatively short lived. The British Parliament passed the Sterling Silver Money Act in 1825, which made British coins the only recognised form of currency and ended any legitimate use of the holey dollar and dump in the Australian colonies. A dollar nominally weighed 550.209 Spanish grains, which is 423.900 troy/avoirdupois grains (0.883125 troy ounces or 27.468 grams), 0.93055 fine, so contained 0.821791 troy ounces (25.561 g) or 394.460 grains fine silver. Its weight and purity varied significantly between mints and over the centuries. In contrast, the Coinage Act of 1792 specified that the U.S. dollar would contain ​371 4⁄16 grain (24.1 g) pure or 416 grain (27.0 g) standard silver. This specification was based on the average weight of a random selection of worn Spanish dollars which Alexander Hamilton ordered to be weighed at the Treasury. The coins had a nominal value of eight reales ("royals"). Before the American Revolution, owing to British mercantilist policies, there was a chronic shortage of British currency in Britain's colonies. Trade was often conducted with Spanish dollars that had been obtained through illicit trade with the West Indies. Spanish coinage was legal tender in the United States until the Coinage Act of 1857 discontinued the practice. The pricing of equities on U.S. stock exchanges in ​1⁄8-dollar denominations persisted until the New York Stock Exchange converted first to pricing in sixteenths of a dollar on 24 June 1997, and shortly after that, to decimal pricing. Long tied to the lore of piracy, "pieces of eight" were manufactured in the Americas and transported in bulk back to Spain, making them a very tempting target for seagoing pirates. The Manila galleons transported Mexican silver to Manila in the Spanish Philippines, where it would be exchanged for Philippine and Chinese goods, since silver was the only foreign commodity China would accept. In Oriental trade, Spanish dollars were often stamped with Chinese characters known as "chop marks" which indicated that particular coin had been assayed by a well-known merchant and determined to be genuine. The specifications of the Spanish dollar became a standard for trade in the Far East, with later Western powers issuing trade dollars, and colonial currencies such as the Hong Kong dollar, to the same specifications. The first Chinese yuan coins had the same specification as a Spanish dollar, leading to a continuing equivalence in some respects between the names "yuan" and "dollar" in the Chinese language. In modern pop culture and fiction, "Pieces of Eight" are most often associated with the popular notion of pirates. In Robert Louis Stevenson's Treasure Island, Long John Silver's parrot had apparently been trained to cry out, "Pieces of eight!" This use tied the coin (and parrots) to fictional depictions of pirates. Deriving from the wide popularity of this book, "Pieces of eight" is sometimes used to mean "money" or "a lot of money", regardless of specific denomination, and also as a synonym for treasure in general. In Pirates of the Caribbean: At World's End the Pirate Lords must meet together by presenting the "Nine Pieces of Eight", since these Pieces were used to seal the goddess Calypso in her human form by the first Brethren Court. As the Pirate Lords were, at the time of sealing Calypso into her human form, too poor to offer real Spanish dollars, they opted to use personal talismans instead, except for the "ninth piece of eight" (Jack Sparrow's), which was an actual piece of eight that is hanging off his bandana in all movies, up to its destruction in the third film. In Neal Stephenson's The Baroque Cycle numismatics, gold and pieces of eight are an integral part of the plot. In Daniel Defoe's Robinson Crusoe, Pieces of Eight are also mentioned among the types of currency that the title character encounters. Pieces of eight are the currency used in the video game Puzzle Pirates and in the Monkey Island game series. Pieces of Eight is the eighth studio album and second concept album by Styx, released on 1 September 1978. In May of 1987, Neil Peart of Rush recorded a flexi-disc for Modern Drummer magazine titled, Pieces of Eight. Wikimedia Commons has media related to Spanish dollar. ^ "Dissemination of Hispanic-American coinage". Encyclopædia Britannica. Retrieved 7 February 2012. ^ Woodcock, Ray (1 May 2009). Globalization from Genesis to Geneva: A Confluence of Humanity. Trafford Publishing. pp. 104–105. ISBN 978-1-4251-8853-5. Retrieved 13 August 2013. ^ Thomas J. Osborne (29 November 2012). Pacific Eldorado: A History of Greater California. John Wiley & Sons. p. 31. ISBN 978-1-118-29217-4. Retrieved 13 August 2013. ^ Davies, Roy. "Origin and history of the world dollar and dollar sign". ^ Cordingly, David (1996). Under the Black Flag: The Romance and the Reality of Life Among the Pirates. Random House. p. 36. ^ Oxford English Dictionary, entry on "dollar," definition 2 ("The English name for the peso or piece of eight (i.e. eight reales), formerly current in Spain and the Spanish American colonies"). ^ "Production of the Leeuwendaalder". ^ "Lion Dollar - Introduction". ^ "Holey dollar - National Museum of Australia". ^ "History: Fact Sheet 1" (PDF). Royal Australian Mint. Australian Government. Archived from the original (PDF) on 12 March 2011. Retrieved 16 December 2015. Hockenhull, Thomas (ed. ), Symbols of Power: Ten Coins That Changed the World (British Museum, 2015): The Dollar (pp. 130-145). Pond, Shepard (February 1941). "The Spanish Dollar: The World's Most Famous Silver Coin". Bulletin of the Business Historical Society. The President and Fellows of Harvard College. 15 (1): 12–16. JSTOR 3111072.